Home Features Restaurant Review: Can I move into the Chicago Pasta House? Restaurant Review: Can I move into the Chicago Pasta House? Chicago Pasta House’s portion were plentiful and worth every penny. Hours: Sunday – Thursday: 11 a.m. – 10 p.m.
Friday and Saturday: 11 a.m. – 11 p.m. The Riverside area has plenty of culinary options that any college student, or person passing through, can enjoy. There’s everything from pho to burgers and everything in between. But what the Riverside area is really missing is an actual Italian restaurant (sit down Olive Garden and Macaroni Grill fans) and the Chicago Pasta House solves that conundrum. Chicago Pasta House is only six and a half miles from campus, and the time spent on the freeway is minimal. It’s close enough to campus that it doesn’t require NASA rocket launching-type planning to go there but far enough way for a nice change of scenery. The restaurant is one of a kind, as it was founded by owner Fonzi’s parents after they moved here from Chicago in 1987. The interior screams originality with its cozy feel and airbrushed murals of Chicago on the wall. If you’re familiar with authentic Italian food or you’ve been to the East Coast, the inside of this restaurant will immediately feel like home to you. The outside patio mimics the coziness of the inside but with a ballpark feel to it, which was fitting considering the very visible Chicago Cubs memorabilia. Upon sitting down and looking at the menu, it becomes immediately clear you’re in for a treat (I suggest wearing stretchy pants or loose fitting shorts). As an Italian, I can say that the only way we like to eat is to overeat, and the portions in the pictures reflect that. Every dish is authentic Italian and Fonzi assured us that every dish was assembled with the best possible ingredients. The menu has more options than Home Depot has paints, so there will undoubtedly be something for everyone and every palette. It’s also broken into categories, such as appetizers, pastas, pizzas, stuffed pizzas and then dessert so it’s hard to get lost or overwhelmed by the menu. As I scanned the menu, I realized that this place was the real Italian deal. I decided to pick something from every part of the menu to really get the full experience of what Fonzi had to offer, so I went with the fried calamari as an appetizer, the veal a la Sicilia for pasta, the eggplant parmesan for pasta lovers who aren’t meat lovers and finally the meat lover’s stuffed pizza. All of the dishes were more than well-portioned and they looked expertly crafted on the plate. They all smelled amazing too, which immediately makes you want to dive in with reckless abandon. Each entree is also accompanied by a salad and a bread roll topped with olive oil and parmesan cheese. 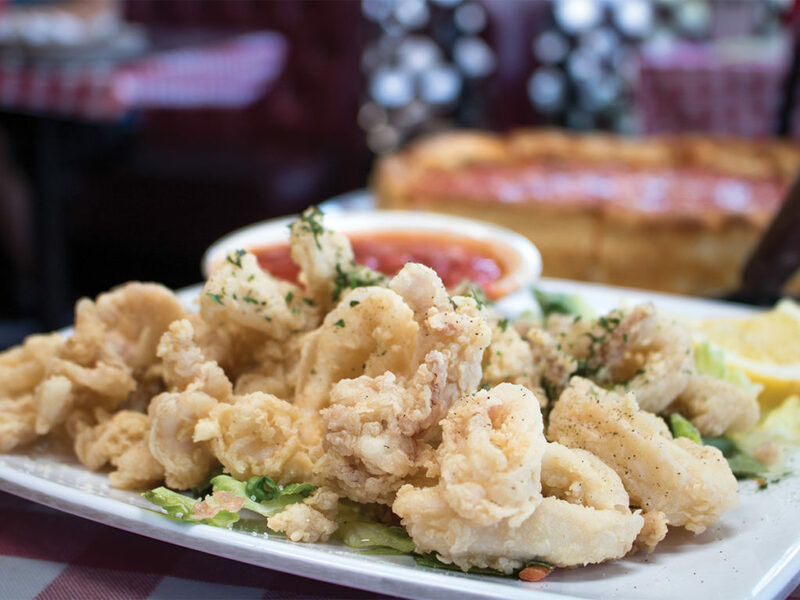 The fried calamari held the perfect dichotomy of crunchy on the outside, tender on the inside. The fried calamari was delicious, and I don’t even like seafood that much. Every piece was perfectly crunchy, not too salty and, most importantly, not too fishy. The calamari was also served with lemon wedges and a bowl of house-made roasted garlic marinara sauce, which added great flavor without making the calamari soggy. The tenderness was also key, as it created a nice dichotomy of crunchy on the outside and tender on the inside, the way all fried food should be. The veal a la Sicilia did a phenomenal job of incorporating one of Italy’s finest aspects: The sea. The veal cutlets are breaded and fried with pieces of diced shrimp that add a mild shrimp flavor and don’t come off as overly fishy and ruin the dish. The tomato-basil marinara sauce had the perfect consistency to go with the veal, as it was a little thicker than usual, which made the linguine noodle it was served with very appropriate. And of course, the veal was tender and flavorful as you’d expect veal to be, but it wasn’t overly salty like how a lot of chain restaurants make it. For all my vegetarians out there, Fonzi’s eggplant parmesan is right up your alley. The eggplant was breaded wonderfully so that it wasn’t breadcrumbs featuring eggplant but rather a pleasing balance between the two. The eggplant itself was cooked to perfection; it was firm on the outside yet tender on the inside and above all else, not too salty. The mozzarella atop the eggplant was top-notch and the house-made marinara was just plentiful enough to not make the dish soggy or a puddle of sauce. It was also served with penne, which was a nice addition in order to offer a change of flavor and consistency from the eggplant. … after seeing this pizza, and more importantly tasting it, I shed a single tear, and realized the war needs to end, because the world needs Chicago style stuffed pizza too. And finally, the dish you’ve all been waiting for, Chicago’s pride and joy (excluding Michael Jordan, of course): The stuffed pizza. Before I get into how it tasted, you need to know the New York-Chicago pizza style war is real, and I am staunchly team New York. But after seeing this pizza, and more importantly tasting it, I shed a single tear, and realized the war needs to end, because the world needs Chicago style stuffed pizza too. This pizza was delicious and not for the faint of heart because it had more layers than an onion and each layer was perfectly packed with meat, cheese and sauce. It was impeccably balanced too: Not too cheesy, not too saucy and not too meaty, and the outside crust is delicious and crunchy as well. Every ingredient in the pizza was detectable and they were all amazing and obviously high-quality. And for dessert, a nice little gift from Fonzi, he brought out a homemade cannoli that looked like it should be put on display, with its perfect shell, powdered sugar dusting, chocolate syrup lattice on the plate and almond, pistachio and peanut crumble that accented the dish very well. This cannoli tasted like the ones right out the Italian bakeries in New York, which is hard to do on the West Coast. Overall, Chicago Pasta House should be every UCR student or Riverside native’s little slice of Italy, because it’s the real deal. The portions more than justify the price, as each pasta entree is about $15 but the sheer quality and taste more than makes up for it. 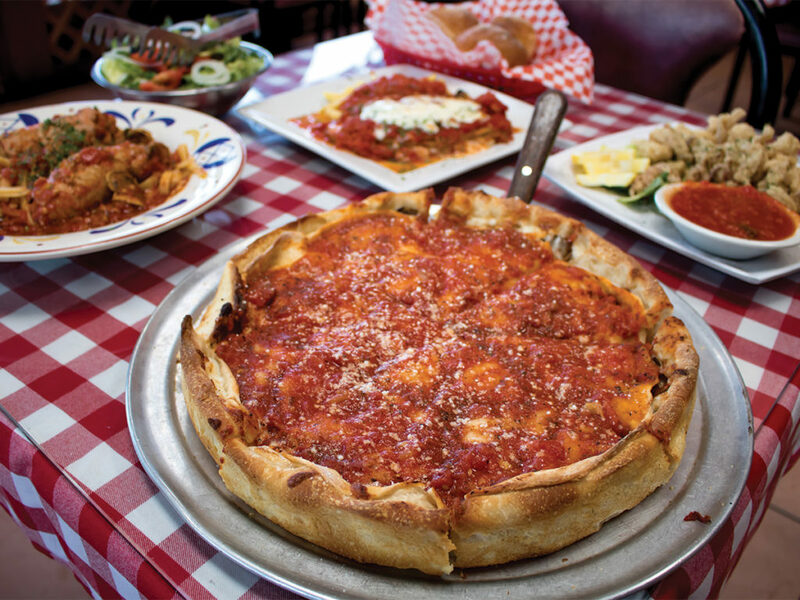 Personally, I recommend making your trip to Chicago Pasta House a group effort to make it more cost effective and allow your group to try everything, as the pizzas, while pretty big, are about $25 apiece. All in all, Chicago Pasta House’s familial ambiance, amazing food and loving hospitality make the experience worth every penny.